2" Red Duct Tape has a strong adhesive that adheres to almost any surface. It's durable and water resistant. 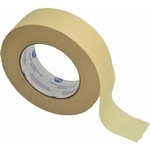 2" Silver Duct Tape has a strong adhesive that adheres to almost any surface. It's durable and water resistant. 3M Scotch-Blue Painters Tape and Film 48"
Scotch-Blue Painters Tape and Film combine the versatility of Scotch-Blue Painters Tape for Multi-Surfaces and the security of extra drip protection with an unfoldable film. Brown Aqua Paper 36" 500 sq ft is a triple-ply asphalt laminated paper typically used under the mortar bed or backer board when setting tile around sinks, showers, or basins. Brown Rosin 35" x 167' ft. (500 sq. ft. roll) building paper is used to protect the surfaces of tile, hardwood floors, doors, windows, and cabinets from paint, dirt, spills, and other debris that generally occur during the final stages of construction, moving, or various home projects. Kraft Paper 40" x 324' sq ft.
Kraft Paper 40" x 324' sq ft. building paper is designed to protect against paint, dirt, spills and other debris on tile, hardwood floors, doors, windows, and cabinets that generally occur during the final stages of construction, moving, or various home projects. Red Rosin 36" x 166' (498 sq ft.) building paper is used to protect the surfaces of tile, hardwood floors, doors, windows, and cabinets from paint, dirt, spills, and other debris that occur during the final stages of construction, moving, or various home projects.